In the wide world of flowers, there are some beauties that last for only a single day. This shouldn't discourage you from adding them to your garden. Flowers that bloom only for a day grow on plants that produce enough blossoms to light up your garden for weeks, with new flowers blooming each day. Many flowers that bloom daily are widely adaptable and can be planted in gardens in both Northern and Southern climates. All offer a range of colors and will delight you when you give them a garden home. Most people know about the morning glory and the moonflower, both of which bloom daily, but there are many other beautiful flowers that have unique blooming schedules that may bloom every day or just for a single day. The Virginia spirderwort, or spider lily, is a large perennial flowering plant that sports strap-like leaves and flower stems that hold dainty white, blue or purple flowers in small groups. Each flower lasts only one day, but the spiderwort plant blooms for a span of several weeks through the summer and will grow in sunny or shady conditions. According to the Lady Bird Johnson Wildflower Center, there are several types of spiderwort beside Virginia spiderwort, all sharing similar characteristics. Because of its adaptability, it is a good example of an indoor flowering plant. The daylily is a favorite, easy-care flowering houseplant that blooms in many bright and pastel colors including red, orange, yellow, cream, peach, white, purple and scarlet. Some daylilies have multi-layered and ruffled petals. Some offer to beautify a garden with smooth petals of a lesser number. The Latin name for daylily, Hemerocallis, comes from Greek words that mean "day" and "beautiful." Daylily flowers are indeed beautiful, but each flower lasts only one day. There are many flowers on each daylily stem, each opening in its turn. Daylilies are widely adaptable when it comes to soil and prefer full to part sun. According to AboutHibiscus.com, the beautiful hardy hibiscus plant can produce over a hundred flowers during a season, each one lasting for only a day. 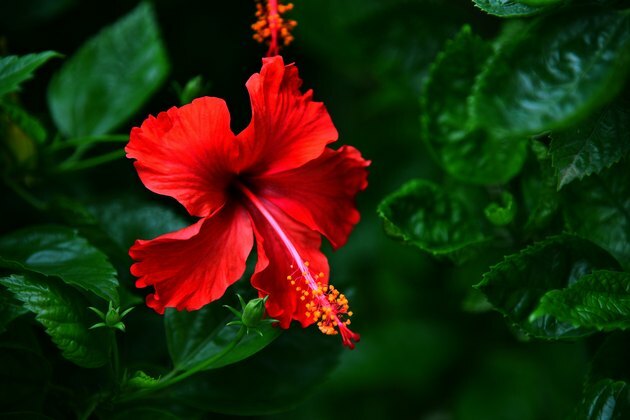 Hibiscus flowers bloom in red, pink, white, and bicolor mixtures and can be 10 inches in diameter. Hardy hibiscus prefers moist soil that has been amended with plenty of organic matter. At least six hours of full sunlight each day is required for best growth and flower production. Tigridia, also called Mexican shell flower or tiger flower, is an attractive flower that grows from a bulb and blossoms in several shades including red, pink, yellow, orange, cream, white and scarlet. According to North Carolina State University, each Mexican shell flower stem holds several flowers and each flower blooms for one day. Another round of blooms follows in a day or two. Tiger flower prefers moist, rich, well-drained soil, and plenty of sun. In the south, it is considered a hardy bulb, but in cooler climates it must be planted in the spring for summer bloom and then dug up in the fall.